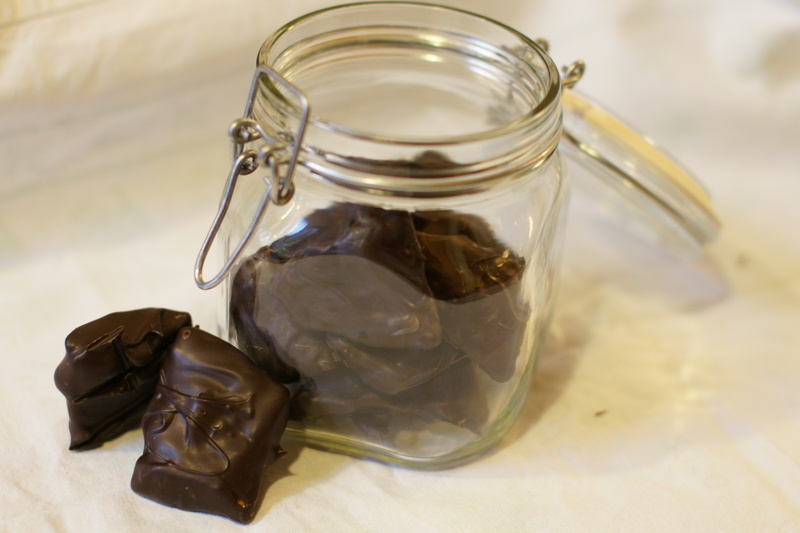 The challenge involved making one chocolate and one non-chocolate lolly (sorry, I can’t bring myself to say candy). The result? One binned strawberry jelly, one binned turkish delight, one binned honeycomb and one winning batch of violet crumble! I started with the pate de fruit. I couldn’t find pectin (apart from Jamsetta) anywhere so I went with this , substituting the raspberries for strawberries (which are cheap and delicious in Australia). All seemed fine until I went to roll them in sugar. They then turned into pretty red cubes swimming in sugar syrup. I must stress that this is my error, not the recipe’s error, but the end result was still something less than magical. This is them before they melted - pretty, huh? I love turkish delight, so it seemed the obvious choice. I used this recipe, from Audax Artifex (http://audaxartifex.blogspot.com) , a person for whom I have huge respect. In a 9 inch (23 cm) baking pan, grease the sides and bottom with vegetable oil or shortening, or use some oil spray. Line with lightly sprayed-oiled parchment paper. In a saucepan, combine lemon juice, sugar and 1 1/2 cups water on medium heat. 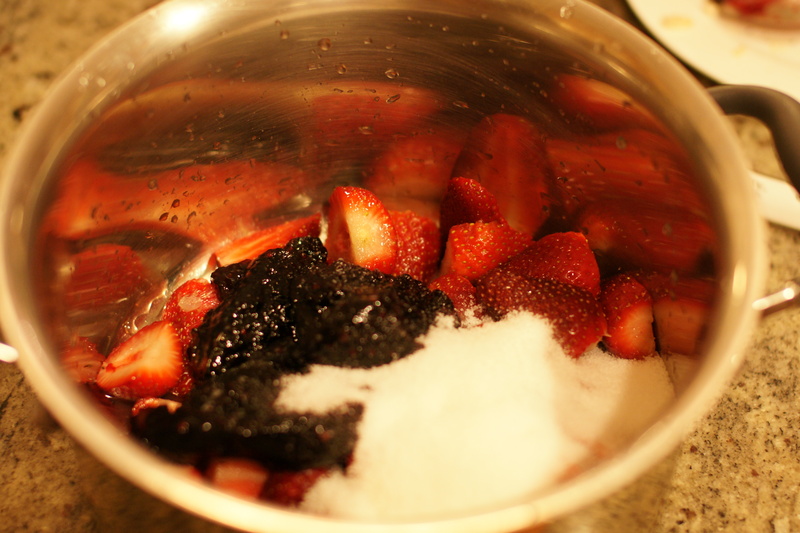 Stir constantly until sugar dissolves. Allow mixture to boil. 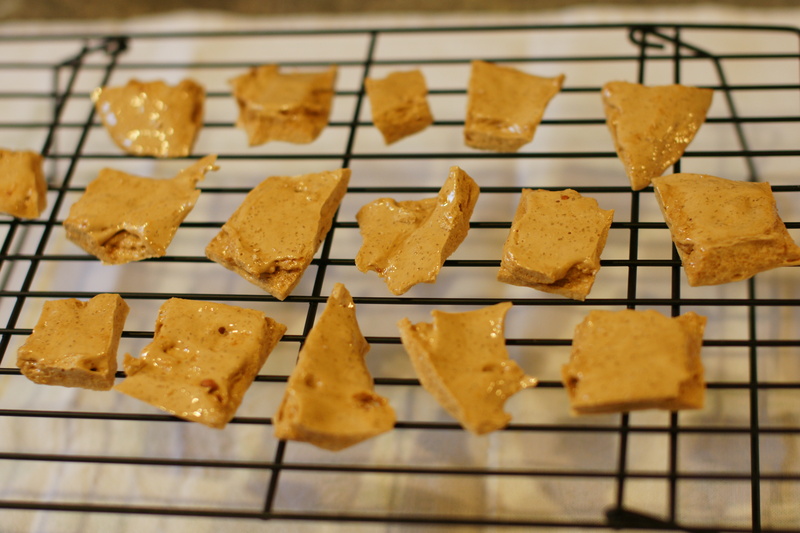 Reduce heat to low and allow to simmer, until the mixture reaches 240 degrees on a candy thermometer (i.e. soft-ball stage – if not using a thermometer test by placing a few drops of mixture into cold water it should form a soft, yielding ball). Beware it can take a long time to reach 240 degrees (easily over an hour) it depends on your heating source. Remove from heat and set aside. Combine sifted cream of tartar, 1 cup sifted corn starch and remaining water in saucepan over medium heat. Stir until all lumps are gone and the mixture begins to boil. Stop stirring when the mixture has a glue like consistency. Once the mixture has become a golden colour, stir in rosewater or whatever flavouring you are using, and the optional nuts and/or the optional food colouring if using. Pour mixture into the lined pan. 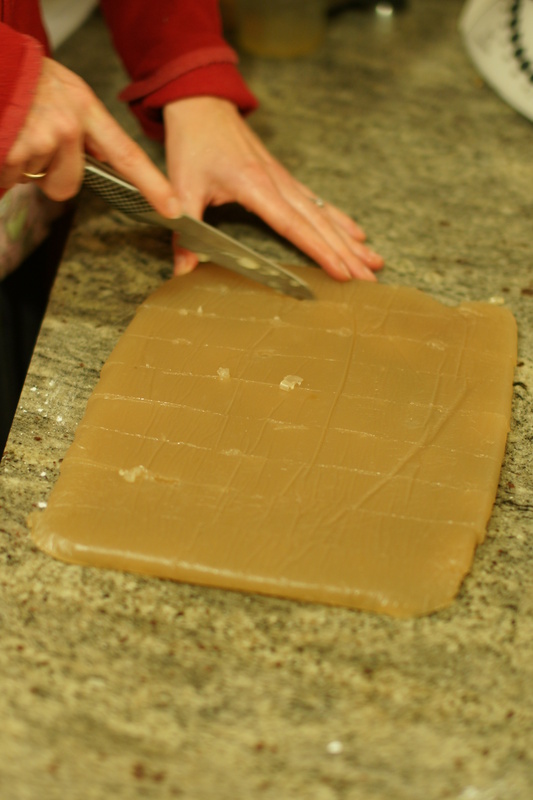 Spread evenly and leave for two days on the counter (do not place it in the refrigerator) which allows the Turkish Delight to stabilise and equalises moisture content throughout. Place tin foil or an air tight covering over it while it “matures”. This is the most important step this resting time stops the Turkish Delight sweating when coated with confectioners’ (icing) sugar and cornstarch. Sift together the coating confectioners’ sugar and cornstarch. 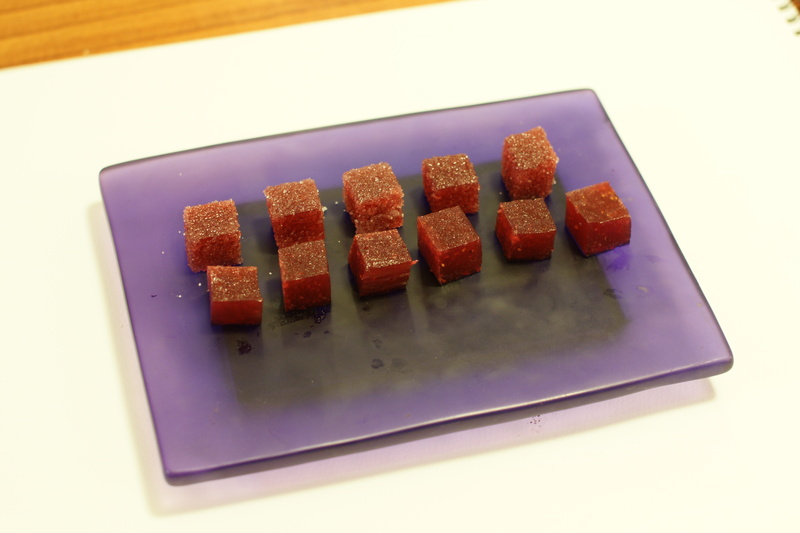 Turn over baking pan containing Turkish Delight onto clean counter or table and cut with oiled knife into one inch cubes. Use a deep metal tin with an air-tight lid or a plastic air-tight container for the dusting container for the coating mixture of confectioners’ sugar and cornstarch, mix the cut up pieces into it and leave for a further two days. When cut into cubes and layered in the cornstarch/icing sugar it is important to use a lot of coating mixture, not a dusting but a veritable bath. After this time you will be left with perfect Turkish Delight, a slight crust covering a gorgeous soft interior. Lastly do not refrigerate Turkish Delight at any time as this ruins the texture; store in a cool but not cold place and pack with lots of the icing sugar/corn starch mixture. This Turkish Delight will last several months. I use an air-tight metal box with lots of icing sugar/cornstrach mixture to store my final product. Always with Turkish Delight keep it dry and cool. 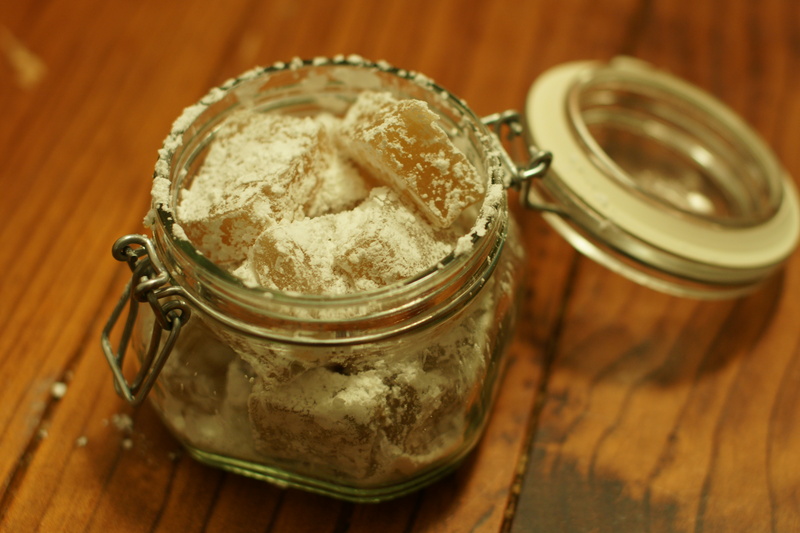 Turkish Delight draws water from the atmosphere so always keep it in an air-tight container. It is important not to use synthetic flavourings they become very bitter in Turkish Delight! Violet water is very strong so be careful with it. My confidence somewhat (read, badly) shaken, I then turned to honeycomb. First I tried a recipe from the Masterchef website. To be honest, I have no idea what I did wrong. I only know that it ended up soft and chewy and totally unsuitable for my purposes. Again (version 3, I suspect this was user error). By this stage I was cranky so when I woke up at 3am (as I generally do) I decided to try again. This time I used a Gordon Ramsay recipe (http://www.burstnoggin.com/content/very-simple-recipes/four-easy-steps-to-make-home-made-honeycomb-in-under-20-minutes/) and it worked like a charm. What a relief! My faith in my lolly making ability may be shaken, but at least now I know what to make people for Christmas. They may not look that great, and I may not actually have complied with the rules of this month’s challenge, but I am counting the Violet Crumbles as a win. Sorry for all the troubles you had with this challenge. Those Violet Crumbles definitely look delicious and rustic, and I’d be glad to get a jar of them for the holidays! I’m glad to hear you had at least one happy result! I love the rustic shape of them.